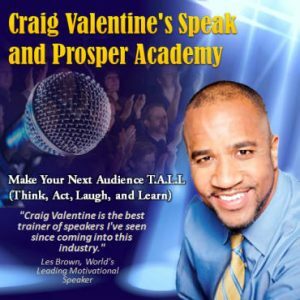 Take your public speaking to great heights and learn the secrets that World Champion speakers know by signing up for this free newsletter. What is your biggest challenge when speaking in public? Any private information you enter in the form will be sent only to Craig Valentine for the purpose of the “Nuts and Bolts” newsletter subscription and the occasional special offer. Your information not be lent or sold to any outside party. Each newsletter contains instruction on how to remove yourself from the list.